However, Columbian and Venezuelan Holy Week traditions are slightly different than those found in Italy, Spain, and other Catholic countries as they reflect the history and culture of South America as well. As a result, if you travel to either of these countries during Semana Santa, you'll be treated to a variety of unique celebrations, events, and religious performances. 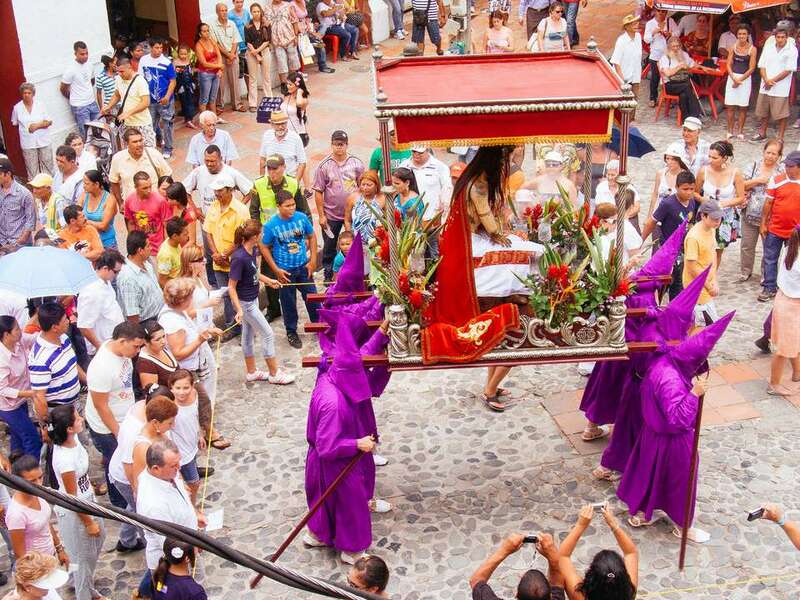 Whether you're exploring the many churches of the small towns of Popayán and Mompox, Columbia, or you're watching a visceral reenactment of the Crucifixion of Christ during Via Crucius in Caracas, Venezuela, you're sure to find plenty of opportunities to immerse yourself in Latin American Roman Catholic festivities this year. In Colombia, the most famous Semana Santa celebrations take place in Mompox, where the Spanish colonial forces built six churches and a chapel that are all used in the Holy Week observations. However, the celebrations in Popayán are also worth note—especially the Festival of Sacred Music, which coincides with Holy Week festivities. Events begin in Mompox the Thursday night before Palm Sunday, which denotes the start of Holy Week. Here celebrants headed by Nazarenos dressed in turquoise robes arrive at Inmaculada Concepción Church and throw stones or kick at the doors to gain entry. Once inside, their robes are blessed in a mass, after which the participants proceed to San Francisco Church. The next morning, the events begin at 4 a.m. with the mass at Santo Domingo Church, followed by more rites at San Agustín and Inmaculada Concepción churches, and Palm Sunday begins with mass at several churches, blessing of the palms at Santa Bárbara, then a procession commemorating Christ's triumphant entry into Jerusalem to Inmaculada Concepción. Monday through Thursday of Semana Santa are taken up with religious processions, retreats, sermons, and other celebratory events. On Thursday, the Last Supper is reenacted, following by the Viernes Santo (Good Friday) crucifixion with masses and solemn rites. Sábado de Gloria, or Saturday, is filled with anticipatory prayers and rites, processions and religious fervor. Domingo de Resurrección, (Easter Sunday) is a joyous day with masses, eucharistic rites, and processions. Popayán is known as The White City and has been a religious and cultural center since colonial times, and during Semana Santa, the town turns into an all-out celebration. In a town known for the ratio of churches to residents, the week-long events include religious processions and masses, with a number of residents playing the treasured roles of religious personages. Held at the same time, the Festival of Sacred Music joins together orchestras and choirs of several countries. While Venezuela tends to celebrate the vacation time a bit more than the religious observations of Holy Week, this dichotomy creates a unique opportunity to explore the culture, heritage, and entertainment found across the country. Events in Venezuela for Holy Week center around homes and families, markets and shops, churches and plazas, and the beach—with more flocking t the beaches for fun than attending masses. Nevertheless, you'll still find many processions, reenactments of the Last Days, and the joy of Domingo de Resurrección in cities and towns across Venezuela during Holy Week. The Holy Week festivals in cities across Venezuela celebrate the Christian Messiah's crucifixion and His return from death. On Holy Wednesday, or the day of the Culto del Nazareno, the sacred image of Nazarene is taken on a procession through town while devotees come to pay homage and give thanks for any blessings they have received. However, the most dramatic part of the week is the Via Crucis—a hauntingly lifelike performance of Jesus on the cross that is scarily realistic. On Holy Friday, a procession carrying a representation of Jesus' lifeless body is carried through the city to universal mourning, and the procession from Iglesia de San Francisco in Caracas is one of the most famous in all of Venezuela. This mix of religious celebrations and holiday-making is common throughout the rest of South America, and you'll find special deals for resorts, tours, and family vacations everywhere. However, it's important to keep in mind that the United States Department of State has issued a travel advisory for visiting Venezuela in 2019 due to political unrest, food shortages, and not being able to provide legal aid to Americans in Venezuela. If you do decide to visit Venezuela in 2019, the Department of State recommends that you: do not travel between cities after dark; avoid travel between Simón Bolívar International Airport and Caracas at night; avoid demonstrations; bring a sufficient supply of prescription and over-the-counter medications; and to develop a contingency plan for emergency situations. We have 6 great reasons why you should visit Colombia now!